Tonsillitis is an inflammation of the tonsils. Tonsils are oval, situated at the back of the throat on each - each side of the throat. Tonsils serve as the centre of the body's defences attack bacterial and viral infections. As one of the central body's defences, the tonsils often experience inflammation and swelling is called tonsillitis. 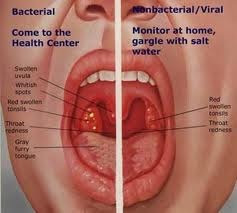 Tonsils are considered as the first line of the body's defence system against bacteria and viruses that enter the mouth. This function can make the tonsils are very vulnerable to infection and inflammation. 1. Drink plenty of water and fruit juice, especially during a fever. 2. Do not drink ice, syrup, food and beverages cold. 3. Warm compresses the neck every day. Rinse turmeric, and noni, juice or grated, then take the water. Add lemon juice and honey. Use to rinse his mouth, and then swallow. Do it 2-3 times a day. Boil bitter with 600 cc of water until the remaining 300 cc, and filtered. Add 150 cc of pineapple juice and honey. Drank 150 cc 3 times a day. Wash all ingredients, boiled with 800 cc of water to the remaining 400 cc, and filtered. Drank 200 cc 2 times a day. 10 leaves of cocor duck. Rinse the leaves of cocor duck, and puree or juice. Use water to rinse the throat. Do it 2-3 times a day.